Discover Belly Dance With Amira! - Find a way to exercise that is fun and fulfilling? - Boost your self confidence and motivation? - Express your love for movement and dance? - Learn to radiate your feminine beauty? 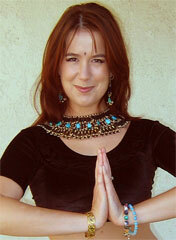 My name is Amira, and I've created an instructional Belly Dance DVD that can quickly put you on the path to learning. I am so sure of what it can do for you, I am gving you my personal, 100% Money Back Guarantee! After selling thousands, and hearing the feedback from so many satisfied women, I'm very comfortable in saying that if you buy my DVD, watch it with a sincere interest to learn, and if you are not completely happy with it for any reason at all, my staff will happily refund your purchase price. Practice 60 minutes of step-by-step instruction with me. Featuring the beautiful music of widely acclaimed global recording artists Phil Thornton and Hossam Ramzy, this DVD has already earned widespread accolades for it's clear and supportive teaching style, attention to solid technique, as well as for its exceptional production quality. Please click HERE to read 61 reviews from some past customers, which we're rather proud of. Hello, my name is Amira, and I invite you to join me in discovering the empowering and exciting world of Bellydance. I have dedicated my life to learning, to belly dance instruction, and am passionate about sharing this wonderful art with women around the globe. I teach workshops and perform internationally, and am thrilled by the changes I see that Belly Dancing can make in women’s lives, no matter your age, size or shape. Middle Eastern Dance is a beautiful, ancient art form that can change the way you see yourself. It’s great for a woman’s health and fitness, is a wonderful way to exercise, boost your self confidence, and will help you find that inner goddess that lives within each and every one of us. Please click HERE to see all the reviews submitted by our customers on Amazon. For a quick look, we've included a few recent testimonials below. I just received your DVD in the mail today and I just wanted to let you know that it is one of the best instructional bellydance DVDs I've seen. You give fabulous descriptions of the moves and you demonstrate them beautifully and flawlessly. The production quality is also excellent: the camera and voice cueing is perfect, which is something very hard to come by. This DVD will have an important place in my library. You have made an instructor-less, beginning student VERY happy!! Please, make more!! I'll buy them if you do!! Thank you so much!! You're beautiful! We received Amira's Bellydance 101 yesterday and the females who wanted to attend the "classes" assembled yesterday evening to begin the instruction from the video. It was a huge success! Everyone absolutely loved the ease in which Amira explained the movements and even demonstrated how to accomplish some of the harder, more difficult movements. They especially loved the changing camera angles so we could see up close and from different levels how to do the movements. Before long, everyone was getting the hang of the moves and we were having an excellent time learning. So, we thank you so much for being patient and understanding with us and please thank Amira for us for the incredible video she's put out. You can be assured that we'll be ordering from you all again soon. Thank you once again! The females of B Co, 4th BSTB. I received your DVD and started practising following your instruction right away. I am so glad I made this purchase, and I would say this video is the best I've ever seen. The demonstration is very clear and useful, after bellydancing for years, it is from you I finally learnd the correct way for the snake arms and polished my shimmy. I also found that your constantly reminding viewers of the correct posture and comparing the incorrect ways are also extremely helpful. I am amazed how much I've learnt from this single video. I am looking forward to more of your DVDs. The DVD also features a BONUS Live Performance by Amira. You can download a full song from Joshua commissioned especially for Amira’s DVD by registering for Amira’s Dance Your Belly! newsletter. 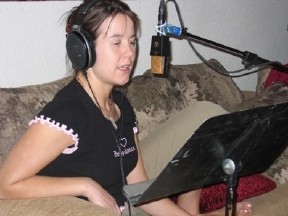 Amira shot the video for this DVD at a professional studio near her home in Las Vegas. Here are some of the photos of she and the crew on location. It’s all in the abs! Taking a break between shots.